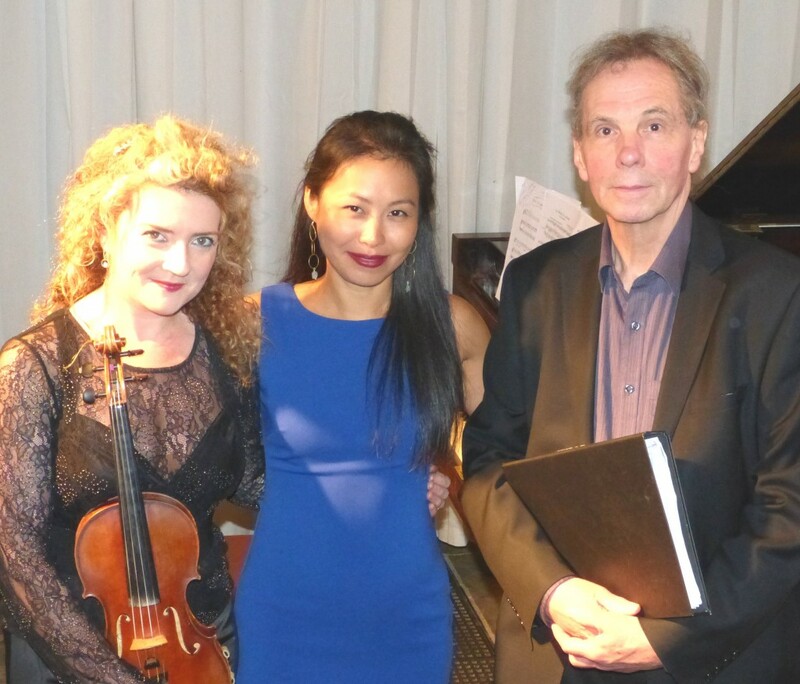 Renowned writer and broadcaster Graham Fawcett, virtuoso violinist Elizabeth Cooney and pianist Grace Mo gave us a stunning evening of poetry and music. Featuring the works of local literary giants who were born or lived in Surrey and Hampshire, Graham recited poetry/prose by Jane Austen, William Cobbett, John Keats, Tennyson, Edward Thomas and Gilbert White. Elizabeth and Grace performed music inspired by the writing, featuring works such as Vaughan Williams’ Lark Ascending and pieces by Elgar, Mozart as well as some Scotch/Irish airs and a little Persian folk music. Graham studied Classics at Christ’s Hospital, where he was fortunate to coincide with a surviving decades-long era of teaching verse composition from English poetry into Greek and Latin metres, so that the first real encounters with Shakespeare, Keats, Tennyson and others came in translating them; read Archaeology & Anthropology and English at Cambridge, and has worked for Southern Arts, the British Institute of Florence, the Arvon Foundation, BBC Radios 3, 4, World Service and Italian Service. He has lived in Italy and French Catalonia and now lives in London. Graham runs reading evenings regularly in Farnham at the Bush Hotel assisted by Elizabeth Cooney. Originally from Cork, Ireland, Elizabeth now lives in Farnham with her husband Nick and six year old daughter Sophia. She is in demand internationally as soloist, chamber musician and has been invited to guest lead orchestras such as the English Chamber Orchestra, Welsh National Opera Orchestra, Oxford Philharmonic, RTE Concert Orchestra and Aurora among others. She studied on scholarship to the Royal College of Music, London with Itzhak Rashkovsky, where she was awarded the highest marks obtainable on graduation. She subsequently held both the Mills Williams and the Phoebe Benham Junior Fellowships at the RCM. This summer will see her play at the BBC Proms at the Royal Albert Hall again with the Aurora Orchestra performing Beethoven’s Eroica Symphony by heart and she will tour to Switzerland, Spain, Romania, Luxemburg, Holland with the Royal Philharmonic Orchestra under Charles Dutoit. The person who influenced her most in her career so far was Ida Haendel who gave her masterclasses on an intense violin course in Keshet Eilon, a kibbutz in northern Israel. Elizabeth was inspired by Haendel’s legendary violin playing, her passion, warmth and humanity and her curiosity in Irish traditional music! What attracts Elizabeth most about a musical career is the possibility of bringing joy to people through their ears and the opportunities to travel to places sometimes off the beaten track such as Alaska, Siberia and Mexico. Her favourite music to listen to is Richard Strauss’ epic Alpine Symphony. Favourite composers include Bach, Beethoven, Dohnanyi and Prokofiev. The biggest breakthrough in her career came when she was awarded 2nd prize and audience prize at the Sion-Valais International Competition for Violin in Switzerland and when she was awarded a Wigmore Hall Recital by the MBF. Elizabeth endeavours to play more chamber music closer to home in Farnham and to invite distinguished friends to play new repertoire with her. She thinks it important to perform the music of living composers to new audiences and sometimes in unusual venues. Other music she listens to would be Oscar Peterson on LP, Bjork (having recently performed with her at the Royal Albert Hall) and Procol Harum (performing with them at the Royal Festival Hall as co leader of the Royal Philharmonic Orchestra). Born in Taiwan, raised in Canada, and now lives in London, Grace Mo has established herself as a versatile musician, performing as a soloist and appearing with different ensembles in diverse projects. She has studied at the University of British Columbia and later at the Guildhall of School and Drama where she held both prestigious Leverhulme Chamber Music Fellowship and Piano Fellowship. The person who was the greatest influence on her career so far was her teacher and mentor from the GSMD, Joan Havill, who studied with Nadia Boulanger and Louise Kentner. What attracted Grace most about a musical career is the power of expressions and emotions that serve as a major source of inspiration and energetic drive in her daily life. Whether in a live performance or in a music lesson, she finds touching people’s lives with music a privilege – and a wonderfully fulfilling one. In her recent interview with the ITV ‘Border Life’ program, she pushed the idea further and explained that it is equally important to reach out to audience in more remote part of the country. Grace showcases a wide range of repertoire and styles, but her fondness for Bach, Mozart, Beethoven, Chopin and Ravel are reflected in their frequent appearances in her concert programmes. Between piano practising, performing, and teaching, one can often find Grace relaxing and practising yoga on her mat, working on her very own instrument – the body. She also finds pleasure in paintings, calligraphy, travelling, and sports.